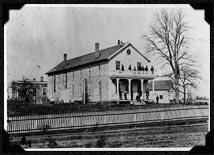 Edison was born in Milan, Ohio, in 1847. He had little formal education but was a voracious reader and developed an understanding of electricity and chemistry as an itinerant telegraph operator. In 1869 he proclaimed himself an inventor. After moving to New York City, he proceeded to make a series of improvements in printing telegraphs. 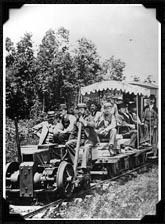 With profits from these early inventions, he established a laboratory about 20 miles from New York at Menlo Park, New Jersey, in 1876. There he gathered a dozen men, some with special scientific or technical skills, and put at their disposal a range of materials and equipment. Edison brought to the enterprise an inventive genius, dogged determination, and a special ability to get along with other men - to work with them, relax with them, and inspire them. In a period of four years he and his colleagues invented the phonograph, a carbon-resistance telephone transmitter, a much-improved dynamo, a practical incandescent lamp, and many other patentable devices. Edison earned the title "Wizard of Menlo Park" and worldwide renown. He married and had three children. But even though his home was only a short distance from the laboratory, he spent little time there. Edison preferred the excitement of chasing after new inventions. Edison was already known as the "wizard" when he began his quest for an incandescent light. Menlo Park compound, winter 1880-81. Menlo Park laboratory, 1880, with newly invented electric lights installed overhead. 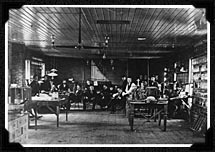 Menlo Park laboratory, about 1879.